My New Year’s Resolution..Let’s Get Healthy! Well I’m with you, folks! Even with the pregnancy, I am committed to healthy habits this year. My short-term goal isn’t weight loss right now, but regular exercise and healthy eating. And now I’m doing this for myself and the baby, which is even more motivating! 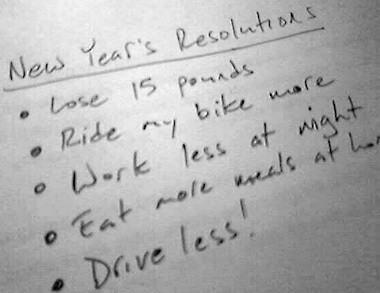 I have a resolution and few specific commitments I’m making in the area of physical health and fitness. My hope is that sharing them with you will give me a form of accountability and motivation to stick with it. Also, you may find this (and my post on healthy habits) helpful for your own lifestyle choices. Here’s to our health in 2009! To exercise regularly and eat a healthy diet for the physical health of me and my baby. Exercise at the gym at least three times a week. Drink eight cups of water a day. Go for a walk two times a week. Eat whole grain pasta, bread and rice. Snack on fruit, veggies and nuts. There’s no way I could get 8 hours of sleep every night! Maybe on the weekends? Sounds like a plan! Keep it up girl both you and your boy will benefit from your healthy lifestyle. I’m also starting my eating healthy pledge! I’ve been eating a lot more fruits and vegetables as well as cooking more of my own food. Good luck. I’ve stopped eating past 7:30pm. That alone cuts a few hundred calories per day for me. I hadn’t been conscious of it but I always snack before bed. I’ve stopped doing this the last few days and I think it will help me be a bit less puffy. I’ve also realized if I want babies in the next few years I’d rather not start gaining weight when I’m at an all-time-high. Good job Mamma! I really want to live healthier… I just don’t know how and what’s possible with my current circumstance. First step for me is to find time to brainstorm ways to live healthier.Good luck sis. so no late night mcdonalds runs that you can blame on pregnancy cravings?